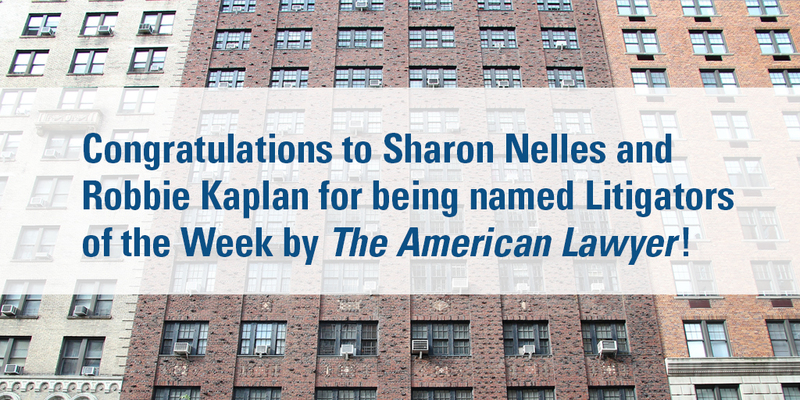 Sharon Nelles, Managing Partner of the Firm’s Litigation Group and member of the Firm’s Management Committee, represents financial institutions and global companies in high-profile, critical company matters that implicate not only civil litigation but also related regulatory, congressional and criminal investigations and enforcement actions. She is currently active in many matters arising from the subprime mortgage crisis. Ms. Nelles has represented such clients as Volkswagen, Moody’s, JPMorgan Chase, Standard Chartered Bank, Microsoft and Diageo, among others, in high-profile class action litigation, including the Microsoft indirect purchaser cases, the JPMorgan Chase/Bank One merger litigations and the Volkswagen diesel matters. She has tried cases in the state and federal courts on behalf of such clients as Microsoft, Eastman Kodak Company and General Bank, and has represented prominent firms and individuals in proceedings before the Department of Justice, the United States Congress, the Securities and Exchange Commission, the Federal Trade Commission, HUD, the Federal Reserve Bank of New York and several state attorneys general. Ms. Nelles frequently conducts investigations for corporate clients, special committees and boards of directors. Lead and national coordinating counsel for Volkswagen in numerous federal and state actions, including a multidistrict litigation in San Francisco, as well as regulatory investigations, regarding allegations that its diesel vehicles emitted nitrogen oxides in excess of the limits imposed by applicable U.S. law. Advised on the $14.7 billion resolution with the DOJ, FTC and the multidistrict consumer plaintiff committee. Also advised Volkswagen on its 3-liter class action and regulatory settlements, dealership settlements; and criminal and FIRREA settlements. Lead counsel to Moody’s Corporation and its officers and directors in consolidated shareholder class action litigation concerning the company’s rating of mortgage-backed securities. Defeated class certification in trial court and U.S. Court of Appeals and obtained full dismissal on summary judgment. Achieved non-monetary settlement of related derivative litigation (Southern District of New York/2d Circuit). Advised on the $864 million FIRREA settlement with the DOJ and 21 states regarding Moody’s financial crisis-era ratings of residential mortgage-backed securities and collateralized debt obligations, ending a multi-year government investigation. Current counsel to U.S. and non-U.S. companies in significant non-public investigations by the Department of Justice, the United States Attorney’s Office, the Securities and Exchange Commission and several state attorneys general concerning the subprime mortgage crisis, alleged accounting frauds, RICO, money-laundering, market-timing and market manipulation. Counsel to Moody’s Investors Service in an industry-wide investigation by the New York State Attorney General’s Office into practices for rating subprime instruments. Counsel to Microsoft Corporation in SEC investigation of its accounting for revenue, assets and liabilities. 1993, Boston College Law School, J.D. 1990, New York University, M.A. 1987, Mount Holyoke College, A.B.